We design, manufacture and market both OCR software and integrated OCR devices for Automatic Recognition of Vehicle License Plates: processing vehicle registration numbers (number plates) automatically by computer systems. 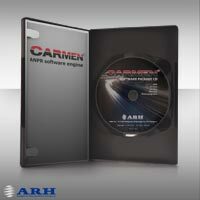 The CARMEN license plate recognition technology is fast, highly accurate and cost-effective. As proof of its success, ARH Inc. is working with approximately 2.000 system integration clients across the globe and operating many thousands of CARMEN ANPR systems in more than 200 countries. CARMEN FreeFlow is an innovative identification technology for traffic surveillance, toll collection, traffic management and many other projects where accuracy, speed and automation are essential objectives. Due to its outstanding technology, its high accuracy rate, the speed of image processing and its adaptability, CARMEN FreeFlow is among the best of its class. In addition to its capability of reading Latin characters the Carmen ANPR engine can read Arabic, Chinese, Cyrillic (and with special training any other types of) number plates as well. The software can execute continuous license plate reading even at vehicle speeds of up to 250km/h. This feature is especially important in convicting speed limit violators or for use in automatic toll collection projects, just to mention a few. CARMEN FreeFlow is a core technology rather than a complete application, and it was specially designed and developed to be easily integrated into complex intelligent traffic applications. As a flexible system, with its comprehensive functional libraries it can be tailored to meet special customer requirements. - To achieve the highest possible recognition rate the image quality is a key factor. ARH provides professional quality cameras designed for license plate recognition! Different models are available to meet all the customer requirements! To achieve the best image and avoid any incompatibility difficulties, CARMEN FreeFlow can be delivered with a proprietary video capture card which serves as a neural network controller too. The system can be used on any existing PC system running under Windows or Linux. Highest efficiency for border control systems, etc. Security monitoring of roads, checkpoints, etc. Prevention of non-payment at gas stations, drive-in restaurants, etc.